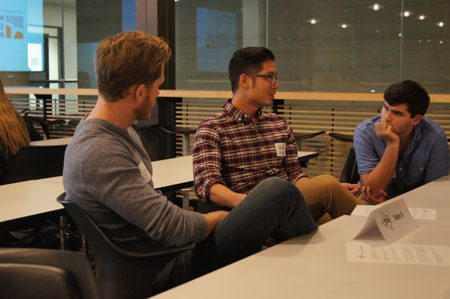 Rotating through small groups of 5-6 students each, the alumni provided valuable insights about their entrepreneurial experiences and shared the lessons they learned during their careers so far. Optimize for opportunity. Travis Devitt, who joined a startup after working in hedge funds for eight years, advised students to look beyond perks or salaries and choose jobs that give us the greatest opportunities for growth and advancement. Often these opportunities can come at startups, where employees are given a lot of responsibility and are continually challenged to help the company grow. Entrepreneurship has no GPA. Michael Koetting put it this way: if you go into your test tomorrow and absolutely bomb it, that grade will stay with you in some form or fashion for the rest of your college career. The impact of failure on your GPA is somewhat irreversible, but the same isn’t true for entrepreneurship. Failures don’t put a stain on a resume, provided you learn from them. In fact, they can often be good things. So when it happens, pick yourself up and move on. Get plugged in to the Austin startup scene. Austin provides a plethora of events for budding entrepreneurs, and these events are a great way to meet other people in the startup scene. A subscription to Austin Startup Digest will help you learn about these types of events. Once you’re there, network, learn from other entrepreneurs, and find out about some of the most innovative ideas coming out of Austin. Do what scares you – but don’t make decisions out of fear. Haley Robison told students that she took her current job at a startup because it was the one job that scared her the most. She said she knew that she would be challenged, that she was passionate about the idea, and that it would help her grow. However, she also said that fear shouldn’t rule your decision-making process. Don’t do something because you’re afraid of what will happen if you do something else. Do it because you want to. Act on your idea now. If you have an idea and you think it’s worth pursuing, start testing it out now. See if you can get people to listen to you, and try to gauge their response. When building a team, make sure you get people who really believe in what you’re doing. If you can’t get a couple of friends who are passionate about working with your idea, chances are you’ll have a hard time convincing investors to invest in your company. 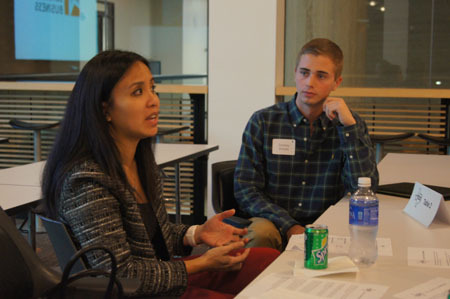 After a successful first event, HBA looks forward to continuing its partnership with BHP alumni, exposing students to the wide variety of career options available to them through BHP. This entry was posted in Event Recaps, News and tagged Cindy Lo, Elliot Oshman, Haley Robison, Joel Knight, Michael Koetting, Travis Devitt. Bookmark the permalink.